Were these New in Box GENUINE VG278Q's ? I highly doubt these are genuine because genuine ones don't do this. I know what stuttering you're talking about on these things. But I've ONLY seen this when trying to use Lightboost mode with incorrect Vertical Totals at wrong refresh rates, e.g. Trying to make 125hz work in Lightboost mode by using a higher Vertical Total than 1149 (you can make the same thing happen on a Benq). Can you post the exact timings you used when you tried 125hz (including all porch, sync and VT values) and 144hz (144hz should use VT 1098 only, and much lower porch and sync (pretty sure it was 24/3 and 32/5 for 144hz, rather than the standard 48/3 and 32/5 used at 100hz and 120hz (and 125hz)). Use ToastyX CRU To create a custom resolution. Don't use the NVCP or the AMD utility. Hi, I just recently bought a brand new ASUS VG278Q and I am having same issues. Ive seen a few reviews claiming this isnt acutally a 144hz monitor just that ASUS false advertisement and its actually a 120hz (possibly). The monitor works perfectly on 120hz but as soon as you go 1 hz higher it starts skipping. Ok so i tried using toasty's CRU and i set the values as you told me to but im not sure if im doing it correctly. 1. Run CRU as admin. All help is appreciated thank you. Edit: Okay so I tried making a custom res in Nvidia settings with the same values as you told me on 144hz and i did realize that the native one (1920x1080 144hz) had different values (Higher VT / HT) than the ones you posted. So I changed them to your ones (2008 / 1098) and the Monitor is still frame skipping BUT slightly LESS now. Is there an even lower way to put the VT / HT value ? "Restart required" means you need to restart your PC, or run the "restart64.exe" tool in the CRU folder. In other words, the GPU driver needs to be restarted, not CRU. In fact, CRU does not need to be running after you do your edits. Everything you do in CRU is stored in the Windows registry, and those entries are read by the GPU driver when it starts. When you run the restart64.exe tool, the driver is restarted without rebooting. If your edits are wrong and you get a blank display, you either wait for like 10 seconds after which the tool will restore your previous, working mode, or you press F8 to restore the previous mode immediately. Ok I had a brain fart and just realized these are NOT VG248QE's. I assumed you guys had VG248QE's, which are always 144hz. 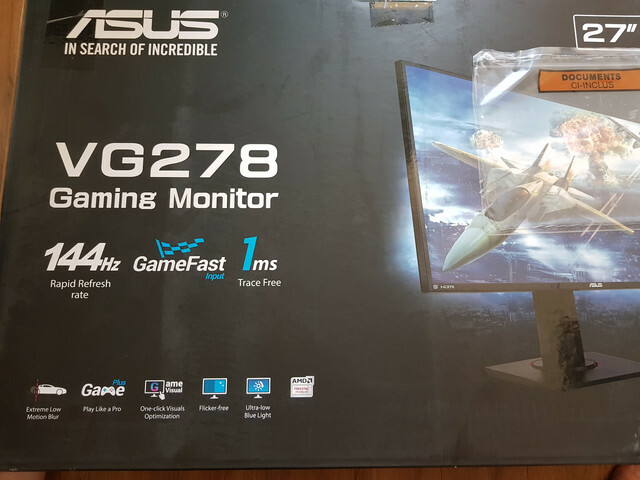 The Asus VG278H was a 120hz monitor while the VG278HE was 144hz. I'm not sure if one used a CMO (CMI?) panel and the other used an AUO panel (possibly the same one in the Benq XL2720Z ? I forgot) or if they both were CMI/CMO panels). Chimei or whatever that company is called. I never heard of a VG278Q. I received a new one just today, not the same, i'm certain, they have not the same S/N. This is getting really...disturbing. I've never seen a manufacturer release a monitor that could not perform at its advertised ratings. Asus never did this before. Besides the PG278Q Swifts and Benq XL2730Z panels failing prematurely in the EXACT same ways--not the electronics nor the Gsync module or scaler-but the panel ITSELF failing (both use the same panel, just with different housings--CallsignVega disassembled one and found they are the exact same panel), I never saw any panels released that couldn't work at advertised ratings. Until this one. Even with all the ghosting and quality problems, the VG278HE (144hz) WITHOUT the integrated 3d emitter still worked without stuttering at 144hz and 120hz. And Chief was flaming mad about the quality problems. The older VG278H which was 120hz only and came with a 3d emitter, had higher quality and less ghosting and artifacts. This is the first time in recent history that Asus released a 120hz monitor advertised as 144hz. If this is just a firmware bug.....well good luck flashing the firmware to fix it... :/ How did this get out the door without QA testing? Did anyone ever find out any more information on this? I have the exact same issue with the exact same monitor. Anything above 121hz causes micro stuttering. It isn't TERRIBLE, but it is annoying. I tried everything I could think of and every suggestion that I could find but nothing seems to make any difference. Drivers, cables, other computers, etc. The issue is constant if you try anything above 121hz. Hoping there is something else I can try. I don't think there's anything you can do. Asus sold a broken monitor to people and they have to either return it, or live with it.
" 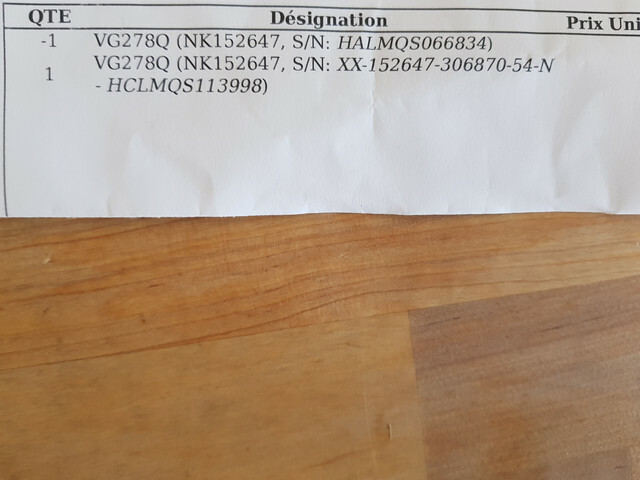 SAME AS THE ONE POSTED HERE, STUTTER ALL THE WAY >>>> "
I even follow the expert advise, don't trust the stock cable,so I buy a VESA certified expensive DP cable.